https://hackaday.io/project/4318-vu-meter-esp8266-ws2812b -- ESP8266+FFT+Teensy -- Person to contact! https://forum.pjrc.com/threads/34095-Teensy-3-2-ESP8266-12Q-High-Speed-ADC-Websocket If you run the esp8266 wifi at 4.6 megabaud, you can get a minimum of 1 megabit per second throughput on wifi, a lot faster if your location does not have a ton of wifi signals, 2 mbit/s is typical. That is decent speed for my application. Now, the ESP8266 v7 and v12, include an ADC (Analog digital converter) pin. This means that the ESP8266 module can process inputs from analog sensors. Light sensors, rheostats, force sensors, etc. Well, I have looked into that and figured out that the ESP8266 has 2 SPI interfaces (SPI and HSPI), the Flash memory uses the SPI interface, so we can attach the ADC to the HSPI interface and configure the SPI clock to between 1MHz to 80MHz depending on what we need. Therefore, it turns out it is possible to use an ADC with SPI interface, though it will involve some changes to the SPI registers but it can be done. The HSPI is definitely better than a software SPI. However, without the DMA (the HSPI isn&apos;t connected to it) the CPU will be distracted every time when a word is received via the HSPI. This means that the 2M words/sec stream will interrupt the 80 MHz CPU of the module on every 40-th cycle. Depending on the wifi software of the module, this may be a quite long delay for the system. Fortunatelly, we can try to speed up the module to 160 MHz in case of insufficient performance. According to the PDF for ESP8266 it supports up to 40 MHz SPI clock (with default core clock) that is enough for our purpose. 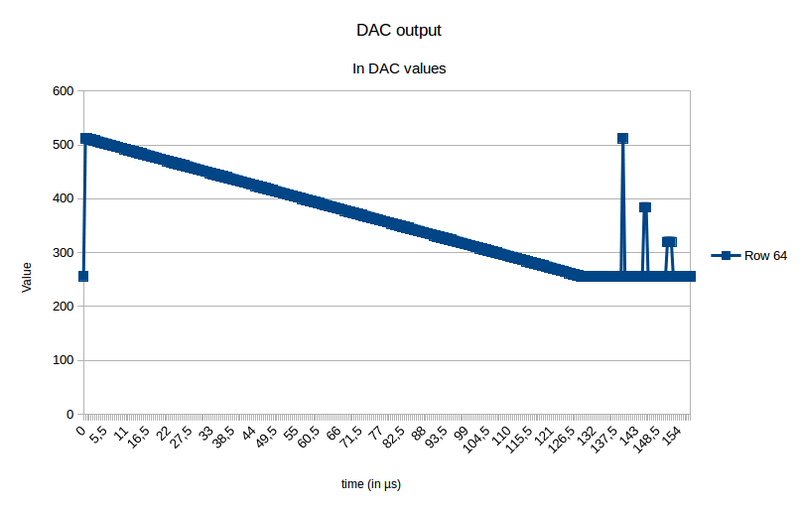 However, it doesn&apos;t have a DMA for the SPI master, so reading of the data from the ADC will be partially software based. This means that we can definitly pass the data through the SPI, but success of the further operations depends on the free CPU resources. Source PDF : reference Manual. // 7 is for interleaved mode. 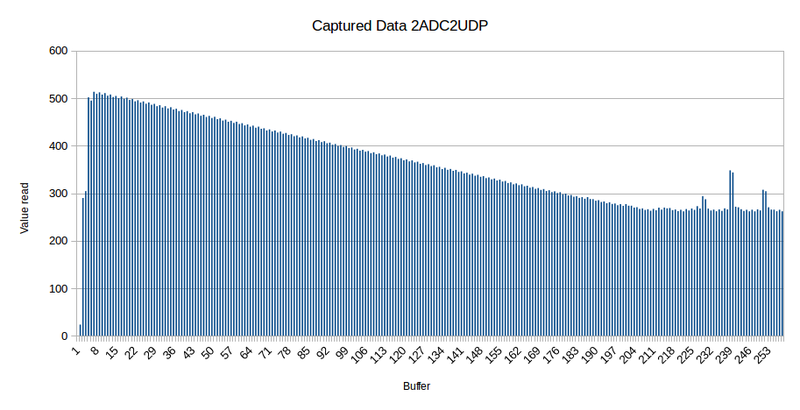 Acquisition takes place in a loop, where 2*BUFFERSIZE data is acquired. Values from ADC1 and ADC2 go into val1 and val2. // Get the values converted from the two ADCs. ESP-WROOM-32 is a powerful, generic WiFi-BT-BLE MCU module that targets a wide variety of applications ranging from low power sensor networks to the most demanding tasks such as voice encoding, music streaming and MP3 decoding. At the core of this module is the ESP32 chip, which is designed to be scalable and adaptive. There are 2 CPU cores that can be individually controlled or powered, and the clock frequency is adjustable from 80 MHz to 240 MHz. The user may also power off the CPU and make use of the low power coprocessor to constantly monitor the peripherals for changes or crossing of thresholds. ESP32 integrates a rich set of peripherals, ranging from capacitive touch sensors, Hall sensors, low noise sense amplifiers, SD card interface, Ethernet, high speed SDIO/SPI, UART, I2S and I2C. The integration of Bluetooth, Bluetooth LE and Wi-Fi ensures that a wide range of applications can be targeted, and that it is future proof: using Wi-Fi allows a large physical range and direct connection to the internet through a Wi-Fi router, while using Bluetooth allows the user to conveniently connect to the phone or broadcast low energy beacons for its detection. The sleep current of the ESP32 chip is less than 5uA, making it suitable for battery powered and wearable electronics applications. ESP-WROOM-32 supports data rates up to 150 Mbps, and 22 dBm output power at the PA to ensure the widest physical range. As such the chip does offer industry leading specifications and the best optimized performance for electronic integration, range and power consumption, and connectivity. ESP-WROOM-32 has Espressif’s long term support — ESP32 will be covered under Espressif’s longevity program and be available for the next 12 years. The design of ESP-WROOM-32 will be open-source when it has been fully optimized. Feedbacks about the module, chip, API or firmware can be sent to feedback@espressif.com. 4 STM32L471QE STM32L471QE NoP 3_ 12-bit ADC 5 Msps, up to 16-bit with hardware oversampling ?? ?? 6 ESP32 ?? NoP ?? ?? ?? 10 BBC Microbit ?? NoP Not really a uC for us... ?? ?? 11 Nucleo F401RE STM32F401RE ?? Joris working with this one ?? ?? X BBC MicroBit A voir NoP ?? ?? ?? Getting more on the ADC. Working ... with an external ADC. We need to test beforehands. EMW3165 : "All I see is an under 8USD STM32F411CE dev board with some wifi gadget"
Playing with a R2R resistor ladder, AKA the quick DAC. An R–2R Ladder is a simple and inexpensive way to perform digital-to-analog conversion, using repetitive arrangements of precise resistor networks in a ladder-like configuration. A string resistor ladder implements the non-repetitive reference network. Let&apos;s try to see if we can do some signal with it! Let&apos;s try something with the variant 1, feeding the Arduino a translation of one image! It has 28K of flash, let&apos; remove 2k for code, 26kb, using 6-bit accuracy, is 64, leaves 4k points.